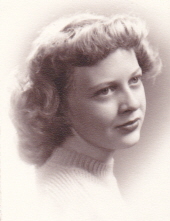 Marjorie Ann "Marge" Beckett, nee Snyder, 93, died April 4, 2019 in Des Plaines. The eldest of four children, Marge was born October 12, 1925 in Gary, IN and grew up on the Southeast Side of Chicago. She attended Horace Mann Elementary School (also known as "HorseMan") in South Chicago, where she met lifelong friends including Helen Regan, the late Doris Olson, and the late Louise Morinec. In her youth, Marge was a Scout, an active member of the 75th Street YMCA, and was a member of the championship-winning speedball team at South Shore High School. She graduated from South Shore High in 1943 and DePauw University in 1947. Marge worked in office jobs and, briefly, as a 6th grade language arts teacher in Woodstock before marrying the love of her life, Richard Henry Beckett, on December 25, 1952 in Chicago. They lived in Englewood, Dolton, South Holland, and Monee until Richard's death in 2012. Marge moved to Rolling Meadows in 2013 then to Des Plaines in 2018. She enjoyed reading (mystery novels were a particular favorite genre), traveling, and doing puzzles (especially her daily crossword). Marge was a lifelong Cubs fan. She was overjoyed when they finally won the World Series when she was 91. Marge volunteered as a den mother when her children were in the Scouts and as a reading tutor at the South Holland Public Library. Marge loved to bowl. When she wrote a neighborhood column for the Markham Tribune while living in Dolton, she often reported on her high bowling scores. Marge also wrote a 723-page mystery novel entitled "Corinthian Gravel" in the mid-1980s. Marge was a former member of Southfield Methodist Church in South Shore and Ivanhoe Community Methodist Church in Riverdale. She edited her church's newsletters (the Southfield Methodist News and the Ivanhoe Messenger) for over 4 decades. At Ivanhoe, Marge was active in the Ruth Unit of the Women's Society. In her later years, Marge was devoted to her family. She was a loving grandmother and an excellent caregiver to Richard after he developed Alzheimer's Disease. Marge was a friend to many and will be deeply missed. She was a knowledgeable person who will be remembered for her quick wit, sense of humor, and easygoing nature. Marge is survived by her children George Beckett, Lee Ann (Larry) Kuhn, and John (April) Beckett; daughter-in-law Jayne Beckett; grandchildren Joshua Beckett, Emily (Jesse) Aarsen, Joy Beckett, Jewel Beckett, and Caroline Beckett Kuhn; and sister-in-law Clare Snyder. In addition to her husband Richard, Marge was preceded in death by her parents Lela (Champion) and John G. Snyder; brothers John Snyder, Bob Snyder, and Bill (the late Joanne) Snyder; brothers-in law Doug (the late Dorothy) Beckett and Ernie Beckett; sister-in-law Sylvia (the late Henry) Martynowicz; and her beloved dogs Piggy, Cindy Lou, and Samantha. In lieu of flowers, contributions to the Chicago Public Library Foundation would be appreciated. "Email Address" would like to share the life celebration of Marjorie Ann Beckett. Click on the "link" to go to share a favorite memory or leave a condolence message for the family.